Dogbert (gazing at night sky) No matter how bad the day is, the stars are always there. Dilbert Actually, many of them burned out years ago, but their light is just now reaching earth. DogbertThank you for shattering my comfortable misconception. DilbertIt's the miracle of science. Dilbert comic strip (21 Nov 1990). Quand les physiciens nous demandent la solution d'un problème, ce n'est pas une corvée qu'ils nous impsent, c'est nous au contraire qui leur doivent des remercîments. 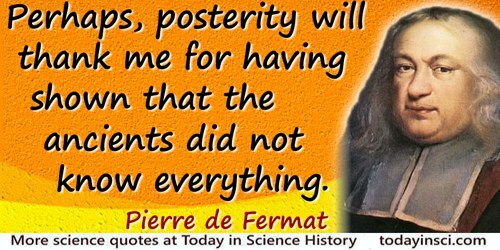 When the physicists ask us for the solution of a problem, it is not drudgery that they impose on us, on the contrary, it is us who owe them thanks. La valeur de la science. In Anton Bovier, Statistical Mechanics of Disordered Systems (2006), 111. 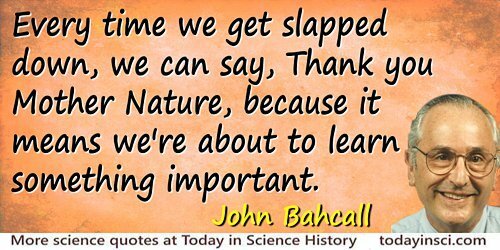 Every time we get slapped down, we can say, “Thank you Mother Nature,” because it means we’re about to learn something important. Quoted at end of article of Michael D. Lemonick and J. Madeleine Nash, 'Unraveling Universe', Time (6 Mar 1995), 145, 84. God healeth and the physician hath the thanks. In John Ray, A Compleat Collection of English Proverbs (1678, 1818), 7. Many thanks for the sending me the book Biology of the Striped Skunk ... Frankly, I doubt whether I shall read it or not, unless I happen to have some intimate contact with a skunk which may induce me to learn more about him. Undated letter to a member of the Natural History Survey. In D. S. Tarbell and A. Tarbell, Roger Adams, Scientist and Statesman (1981), 192. Out of man’s mind in free play comes the creation Science. It renews itself, like the generations, thanks to an activity which is the best game of homo ludens: science is in the strictest and best sense a glorious entertainment. Science: The Glorious Entertainment (1964), 110. Former governor of Wisconsin, Founder of Earth Day. From Lectures on 'Architecture and Painting' (Nov 1853), delivered at Edinburgh, collected in The Seven Lamps of Architecture (May 1849, 1887), 172. You explain nothing, O poet, but thanks to you all things become explicable. In La Ville (1890), Act 1.